Elland were beaten 19-16 away to Salford City Roosters yesterday in a game which had three red cards. The sides’ fates in Division One of the Conference have been decided - Salford are sure to finish in the bottom three with Elland just above the drop zone - but that didn’t stop it being a feisty encounter. The hosts were soon 8-0 up with a converted try under the posts from a kick through and a penalty, after Cayci Pearson had been sin binned for punching. 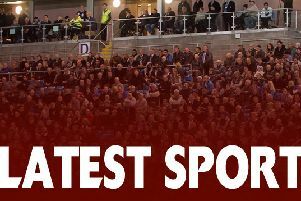 Salford’s scrum half was next to get a yellow but the home side were undeterred and their left winger made a 50 metre break down the touch line and scored under the posts for another six-pointer. Salford continued to give away penalties for high tackles and off the ball offences and their second row was given a red card for head-butting, quickly followed by a yellow card for a prop. Elland started to settle and were piggy-backed down the pitch by Salford penalties. A brilliant drive and off-load from Andy Shickell put Dave Webb in for a try which Pearson converted to make it 14-6. Salford found touch from the re tart and slack Elland defence enabled Salford to score a drop goal just before the half time whistle. Elland’s short restart was gathrered by Jack Fairbank, who sent Joe Nicholson away down the left but he was pushed into touch. Richard Crabtree and Joe Nicholson got back to stop Salford scoring from a long kick. A Phil Taylor break took him close and he got his reward soon after from dummy half after Shickell had made a 50 metre break, cutting the deficit to five points. Shickell made another fine break but a knock on at the next tackle halted the attack. Salford then had a prop red carded for dissent. An off-load from the influential Judd Fairbank gave Dave Webb the chance to break but he lacked support. Salford dropped a goal with 24 left to play and Salford scored another drop goal but Elland drew level following a charge down by man of the match Judd Fairbank and a Salford knock on. The ball went out wide to Tom Harnett, who gave the full back a strong hand off and powered under the posts. Pearson conveted but was then dismissed for a high tackle. Salford took two points from the penalty. Jack Fairbank looked certain to score after a great inerception and lengthy run but was brought down 10 metres short and a wild pass to supporting winger Joe Nicholson was knocked on. Salford had the final say with a last minute drop goal.